Safety at EPM is of paramount importance. Safety matters are reported, reviewed and discussed at the highest level. Improvement is constantly sought via regular reviews to ensure practices are conducive to the highest standards of health and safety and ultimately adhered to. EPM has established clear safety goals and objectives, an integral part of which is the monitoring and publishing of actual versus target performance results to all employees. Safety issues are attended to immediately as they arise at EPM, one of WA’s most prominent engineering workshops. Based in Kewdale, EPM has seen strong growth and success since it was founded in 1986 by Managing Director Mark Hanks who has always had an open door safety policy for all employees. “We make sure that any incidents or near misses that our guys bring up are addressed there and then. We don’t wait for the next toolbox meeting,” he says. EPM has a workforce which specialises in manufacturing replacement machine parts for petro- chemical and gas supply equipment, as well as subsea, mining, industrial and agricultural applications. They also repair and manufacture hydraulic cylinders of all sizes. Con Karatzis, who oversees the company’s commitment to workplace safety, is confident as to why EPM has just completed 1000 days without a lost time incident. “Because Mark looks after his employees,” he says. “Any staff member with a safety concern can bypass their supervisor and go straight from the shop floor into Mark’s office and explain their concerns.” Con made a comparison between many other companies that require timely forms to be completed, whereas at EPM the problem is addressed quickly so production continues without delay or disruption. 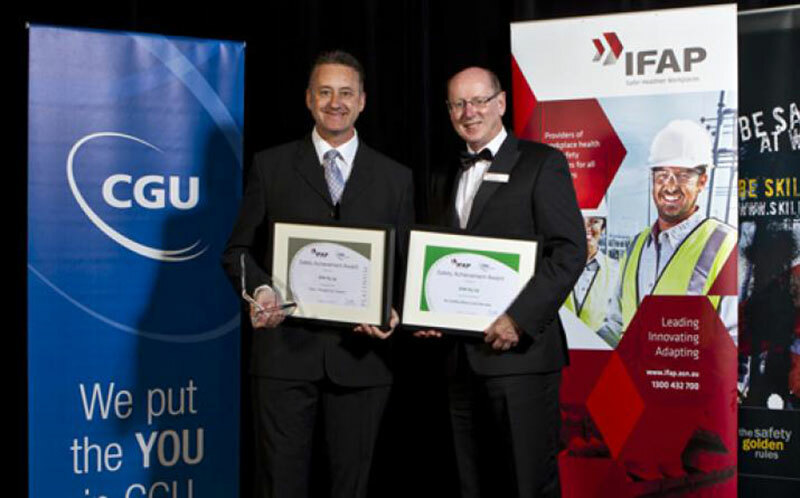 EPM is one of fifteen companies who have won a 2012 IFAP/CGU Platinum Safe Way Achiever Award. 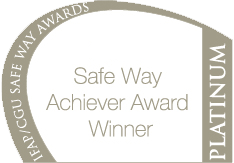 It is EPM’s third platinum, presented annually to companies that have won gold awards five years in a row. Mark Hanks welcomes the Platinum IFAP award with praise and recognition for his staff on the workshop floor and EPM’s management team. He says there have never been any serious accidents at EPM. “If something happened to one of our staff, I would have to carry it with me for the rest of my life,” he says. Although it is many years since EPM recorded a significant workplace incident, the “complacency” that caused the last two of them still gnaws at Mark Hanks. One of them involved a cutter, the other a grinding wheel. In the latter, investigations found the worker had used his hand to push the work piece into the grinding wheel instead of using the correct tooling. As a result he went too far and the grinding wheel took off the top of his finger. EPM has now installed a huge Kuraki horizontal machining centre — it was immediately evident that access was a safety problem, so within three days a special ladder and platform had been built so that it could be operated safely. But, he says that “we are an engineering business with a machine shop and we do our best to do the right thing by our staff all the time, yet we try to limit the constraints that safety systems can put on you so that our business can function without being held back by safety procedures.